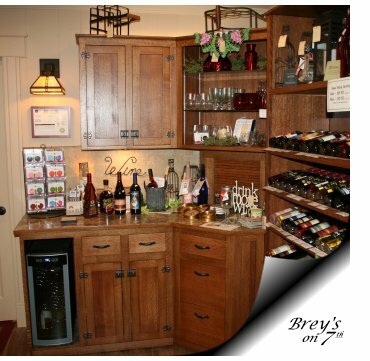 Iowa Native Wines and wine accessories available at Brey's on Seventh. In today’s global environment it is often difficult to find products that are produced right here in Iowa. Unlike other product lines our wine department offers a wide variety of wines produced right here in Iowa. We realize that there is no lack of retailers that offer a variety of wine, but we hope to offer you something that may not be available at larger retailers, which is variety from each winery and help in selecting a wine that suits your taste. We know that the serious wine enthusiasts define wine as a beverage made from grapes and that they often refer to fruit based wines as simply a fermented fruit beverage. Even though we understand there is a fine point of defining terms we don’t feel it should be part of our service to all who enjoy wines regardless of the fruit that was used to produce them. We also know that as individuals we all have a different palate so your choice in wine is often very specific to the character of the wine as it relates to sweetness (or dryness) as well as intensity in the flavor of the fruit that is used to produce the wine. Our goal is to bring our customers a wide variety of both fruit and grape based wines from sweet to dry. We also strive to bring you as much information about the wine as possible to assist you in making your buying decision. For many the only information they need is “how does it taste?” We firmly believe that wine tasting is a part of making a wine selection and offer regular tasting events so you can try before you buy. If you are buying the wine as a gift for others we can offer suggestions based on your input about the people you plan to gift. Ackerman Winery: Ackerman Winery is located in Amana Iowa and is the oldest winery in Iowa. It was established in 1956 and offers many fruit based wines that are all in the sweet range. Many of the wines are produced with fruit grown right here in Iowa with other produced from whole fruit brought in from other states. We are the only wine dealer for this line in northwest Iowa. Eagles Landing Winery: Eagles Landing, the thirteenth winery licensed in Iowa, is located in Marquette Iowa just a few blocks away from the Mississippi River. Like many Iowa wineries it is a family run operation with a vineyard as well as the winery itself. Wines range from fruit to grape based as well as sweet to dry. We are the only wine dealer for this line in northwest Iowa. Fireside Winery: Fireside Winery is located near Marengo Iowa on a beautifully site that includes a tasting room, production facilities, as well as venues for entertainment, family reunions, and weddings. They offer a wide range of grape based wines from sweet to very dry. We are the only wine dealer for this line in northwest Iowa. Santa Maria: Santa Maria Winery is located in downtown Carroll Iowa in a historic structure with a rich history in that community. Widely known across Iowa Santa Maria offers some fun fruit based wines as well as some serious grape based wines. Their facility offers a great venue for weddings, anniversaries, or other large group events.